I really love to celebrate diversity in my classroom. One of the ways I try to do this is to provide lots of skills-based activities featuring readings on other cultures and holidays. 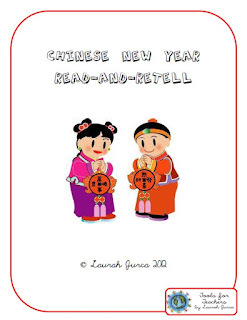 With that in mind, I created my FREE Chinese New Year Read-and-Retell Activity. This year the Lunar New Year falls on February 10. This fun activity is ideal for grades 3-5. It helps your students to learn a little about how the Lunar New Year is celebrated in China and the way this activity is constructed scaffolds your students' retelling and summary of what they learned through the use of key vocabulary words. This download contains the read-and-retell activity at 3 different reading levels to address the needs of all the students in your class. This activity gets students reading, writing, speaking and listening all in one activity. This activity is aligned with Common Core State Standards and WiDA ELD standards. I invite other TpT teacher-authors to share both their FREE and paid products for the Chinese and Lunar New Year. 2. Post a link to this page on your blog or Facebook. This allows even more folks to see your products and the other products that are being shared. 3. Where it says "name" please put the name of the product. If it is a free product, please put "FREE" before the title. If it is a paid product, please put the price at the end of the title. I LOVE celebrating all kinds of diversity and holidays too! And Chinese New Year is dear to my heart. :) Thank you for setting up this awesome linky party! I linked up twice (a product and freebie) and I can't wait to see more products linked up.